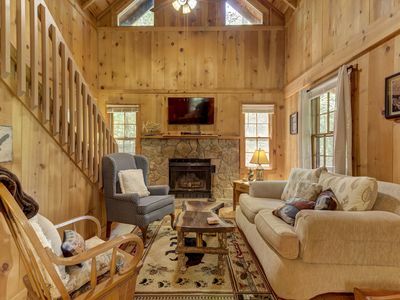 COZY CHALET STYLE CABIN IN NORTH GA. WELL BEHAVED PETS WELCOME. 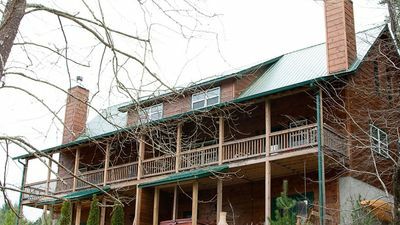 One look at the outside of this sweet little older, family owned vacation home, and you will feel that you have been transported to Bavaria or perhaps Helen. 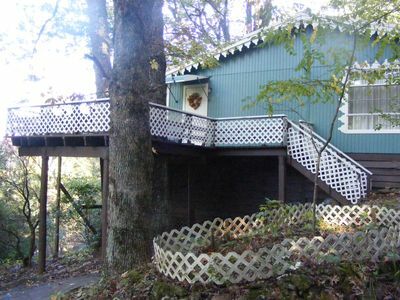 There are large trees and mountain laurel surrounding the chalet on 3 sides. The living room is decorated in eclectic Bavarian style, with steins, cuckoo clocks, garden gnomes, and many other German/Swiss items which have been collected over many years. 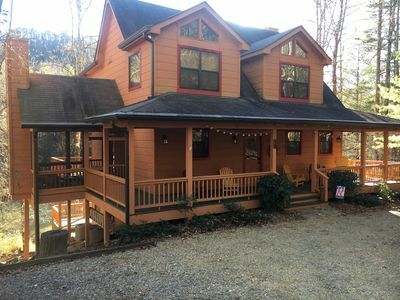 The kitchen is fully stocked with microwave, toaster, coffee maker, blender, dishes, pots and pans for cooking, full sized stove and refrigerator, all utensils. All you have to bring is your food. 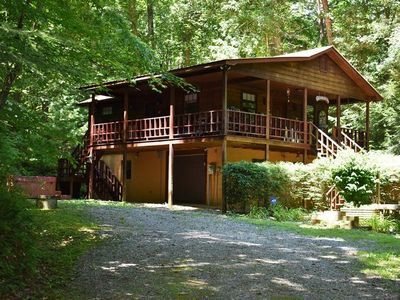 The deck is perfect for relaxing after a hard day of hiking, or searching for treasures at the many antique stores in Dahlonega or Blairsville. 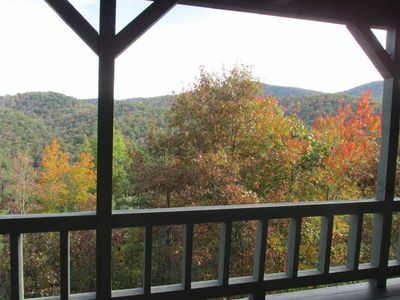 At an elevation of over 3000 ft, there is a year round mountain view to enjoy. 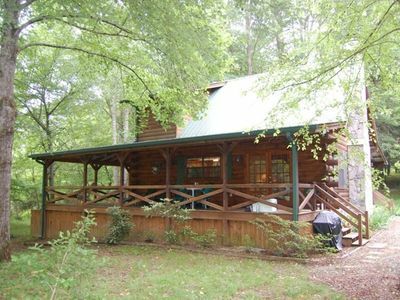 This cozy cabin is the perfect home base for all of your N. Ga. activities. 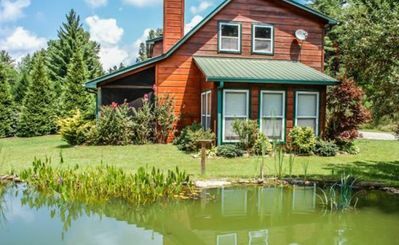 Situated in beautiful Coopers Creek Wildlife Management Area, less than one mile from Lake Winfield Scott for hiking, picnicking and swimming at an uncrowded family beach on a clear mountain lake. 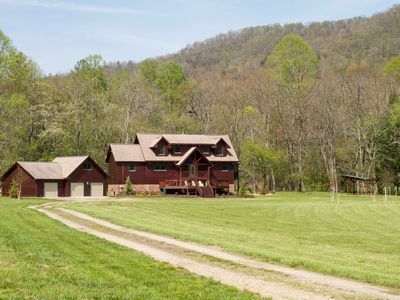 6 miles from the many activities at Vogel. 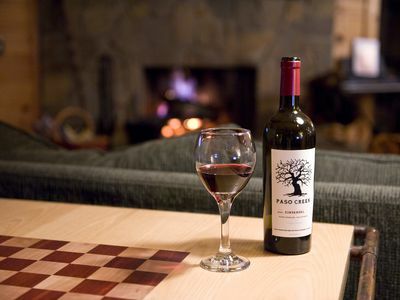 Take a day trip to the Alpine village of Helen approx. 36 miles away or try your hand at gold panning in Dahlonega which is a 30 minute drive away. For roasting hot dogs or marshmallows, there is a large fire pit in the yard with wood provided. PET FRIENDLY! 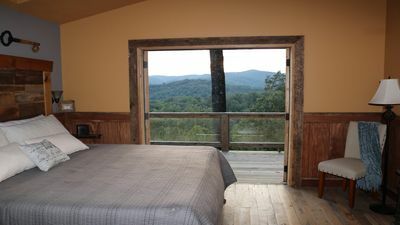 Up to 2 well behaved pets welcome if crated or taken with guests when leaving cabin in order to prevent damage to cabin. Fenced in exercise area for pets. 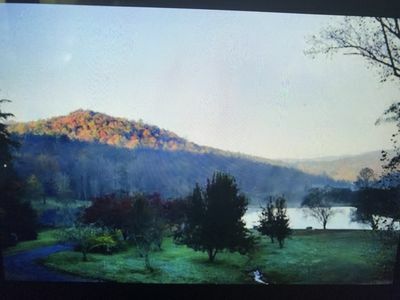 Voted..One Of The Most Beautiful & Peaceful Places In The Eastern U.S.
Book NOW for December Specials!! 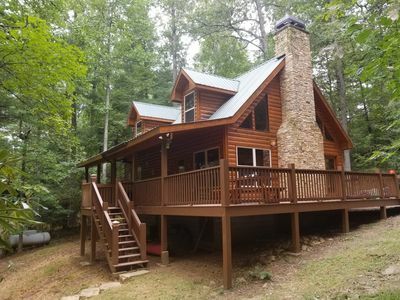 Cozy Getaway on Toccoa River! 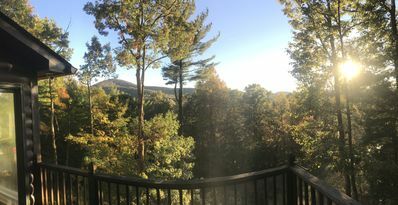 Hot Tub and River Deck! 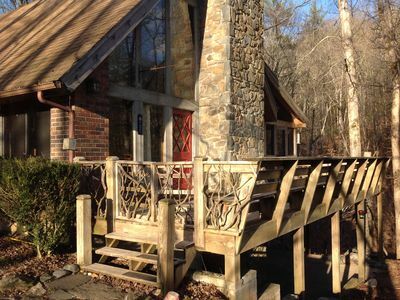 Toccoa River Cabin - Beautiful! Fishing! Tubing! Hiking! 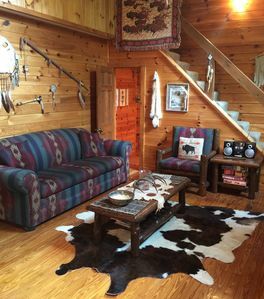 American Indian Decorated Log Cabin On Toccoa River Awaits Your Arrival! 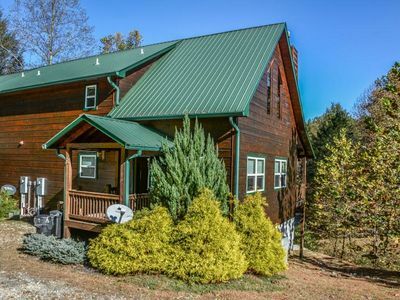 Located 30 minutes from Blue Ridge, GA! Low profile vehicles not suggested. Nature's Soul Nourishing Playground with the Comforts of Home. 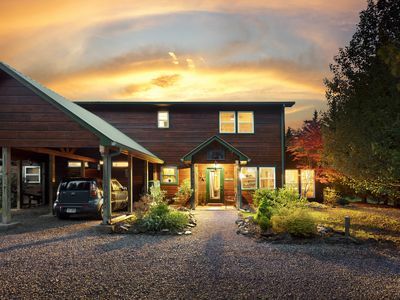 CHARMING FARM Voted Most Beautiful & Peaceful Places in the Eastern U.S.
Gorgeous Cottage w/ outdoor therapy tub amongst National Forest & trout stream. 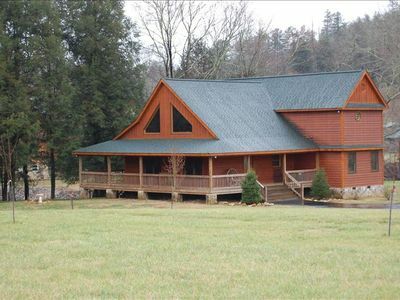 LOCATED 30 MINUTES FROM BLUE RIDGE, GA! 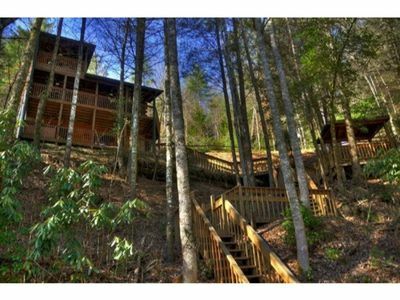 Dog-friendly cabin w/ fireplace, wrap-around porch - nearby trails, angling!